Our PEBA 2301 (Polyether block Amide) is created from a fine powder. The material is flexible and rubbery as well as resistant. 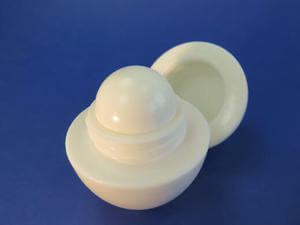 PEBA 2301 is great for functional flexible plastic parts for both prototypes and finished products. The surface of PEBA 2301 is similar to rubber and can resist to stress and fatigue. 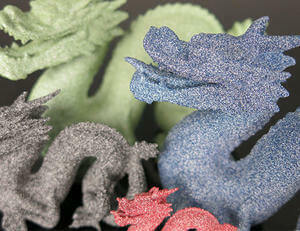 The material is both solid and flexible, unlike some of the other materials offered by Sculpteo. PEBA 2301 is great for both experienced professionals and beginning designers because of its high precision and low cost. Unpolished, the material is white, granular, and somewhat porous. Your object is estimated to arrive in 6-9 business days. Once you upload your 3D model to our website, it is received by a Sculpteo team member, who expertly places the model into the next available batch. The specific printer from which it will be printed is determined mainly by the dimensions of your object or batch, the larger prints being reserved for the larger printers. The machine used for PEBA 2301 is the EOS Formiga P100. SLS uses a highly specific laser that sinters thin layers of powder together one layer at a time. After each round of lasering, the printing bed is lowered and another layer of powder is evenly swept across the top for another round of sintering. This process is repeated at a layer height of 150 - 100 µm until the object is completed. To 3D print PEBA 2301, we use a lower temperature process than with polyamide (130°C instead of 175°C). 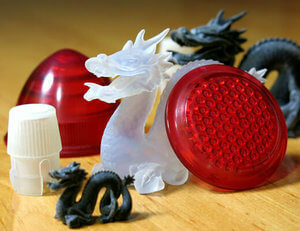 PEBA 2301 is a great 3D printing material for fully functional flexible plastic parts with a high quality. It is durable, and the rubber-like fatigue behaviour qualifies PEBA 2301 as an excellent prototyping and series material. As a result, the object can be used for hand braces, insoles, grippers, handles or seals. Its good chemical resistance and the excellent long-term stability make PEBA 2301 a good technical material. PEBA 2301 can resist to heat below 60°C without any shape alterations. Regarding water qualities, PEBA 2301 is water resistant but not waterproof. Thus the 3D object must not remain in contact with water for extended periods of time. PEBA 2301 is also resistant to some chemicals. Our PEBA 2301 is only delivered with a raw finish which means sandblasted but unpolished. The surface remains somewhat slightly granular but it will fit most of the applications. There is no minimum size for PEBA 2301 prints, keeping in mind minimum thickness for walls and structural aspects, to ensure the object will not break is 1.5 mm. Sculpteo offers an online solidity check tool which highlights parts of the print that may be too thin for a print. From there you are able to tweak your design in order to create an object that has an appropriate thickness. To use it, you just need to upload your 3D file , select your material and click on “Verification” tab. Our PEBA 2301 material has the ability to print the most complex designs of our materials. An example of a complex design is a volume enclosed within another volume, like a chain or maraca. Our printers have the ability to print a fully interlocked chain out of the printer, with no support structures to remove. 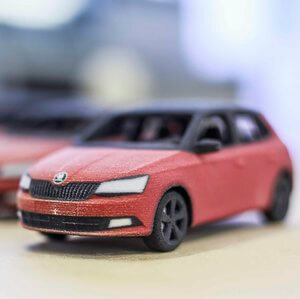 Objects 3D printed in PEBA 2301 can be printed to be assembled as long as a width of at least 0.5 mm is left between the different parts of the object, even if this material is not recommended for this use due to the elasticity of the material.